I am a car guy, believe it or not. I love them. I enjoy car people. Most of all, I love driving down the freeway at 80Mph with the top down and a nice tune beating me along the road. I couldn't work on it if my life depended on it, but I love cars. 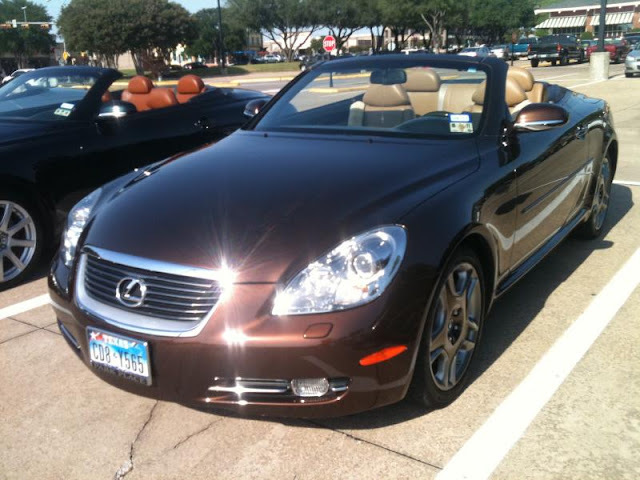 I own a Lexus SC430 convertible. I love it. I've had a lot of cars in my life, 31 at last count, ranging from a 1964 Plymouth Valiant when I was in high school to an Infiniti Q45, Mercedes E320, BMW 5 Series.. lots of nice cars. This one, makes me rethink a car. It is classically handsome. The color is awesome, and it is one of the best cars I have ever owned. 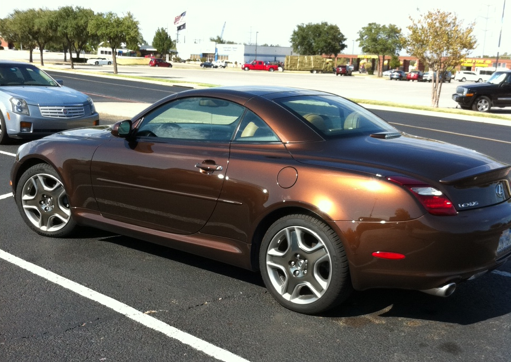 Every time I come home from a trip, when the shuttle driver says, "Brown Lexus" as he stops at my car, I get a big smile. After Monday when I get my LuxLink installed and I can remotely start the car and drop the top, I'll smile even bigger! I think a road trip is in order soon. Want to join me? Do you know if they made this color along with the saddle (orange) leather? I always only find it with camel... which would be my 2nd choice. I have never seen the TigerEye with Saddle. I've only seen 4 live but the rest online. I am not sure if that was an option but you might try Googling the combination. I was driving this morning with the top down and a man in a BMW 6 Series convertible pulled alongside and complimented the car. Gotta love that. haha that's awesome. I was also looking at the 6 series and M6's used online, and then I decided DANGER bad idea. TERRIBLE quality compared to Japanese, and parts way more expensive. I think I want a pearl white sc430 but if I can't find one, I'll go with tigereye or silver as alternate options. Thanks for your reply :) i did figure that out about the saddle combo. I think the camel interior is growing on me, so much that I think it looks even better than the saddle. The ECRU and black are my least favorite, they're just blah. Plus ECRU stains so easily. Most of the older cars with the Ecru interior also have the Yellow looking Maple Burl and I am not a fan of that at all! One more reason to go with the Camel or Saddle. One of the local Lexus dealers here in DFW had FOUR SCs for sale this week! Shocking number, and two were CPO!